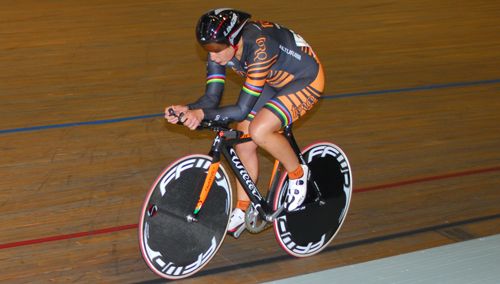 Mel has won Elite National medals, plus World and National Masters’ titles. She tells us how she got into cycling, talks about her cycling trip to Everest Base Camp and the challenges that she juggles every day to compete at the highest level. Mel: I was in a pub one day after work and the conversation got around to exercise and someone put money on the fact that I would not be able to run a marathon. Actually they were not being as harsh as it sounds, as I had never run more than a mile in my life. However, that was like a red rag to a bull and I ran the London Marathon that year. Fairly soon after that, my sister persuaded me to get on a bike and commute to work in London, she even guided me to my office door and back home through rush hour traffic on my first day, riding a £10 beater. If I am honest I was terrified, but I gave it another go the following day and gradually embraced my competitive self, in my need to not be overtaken. I then invested in a proper bike, well sort of, it cost me £50 and then I continued to commute into London for the next 12 years. Shortly after the marathon, a friend suggested I do a triathlon. I wasn’t too bad at the swimming and probably one of the fastest on the bike, but then I would always get overtaken by the entire field on the run, so it was logical to try pure cycling. I didn’t know where to start, but I got in touch with the Surrey League and they put me in a team for my first bunch race at Darley Moor in 2005. I wasn’t much good at road racing, as I generally attacked off the front all the time to no avail, but strangely I loved it and signed myself up for every road race I could get to. Mel: In my first year of racing (2005), I rode loads of road races and a few TTs. Some of the road races were stage races, like the one in Ireland, plus the Bedford and Surrey 2 Day races – where I beat Jo Rowsell in the prologue and then had the honour of wearing the yellow jersey in the stage race that followed. There were also lots of trips to the Hillingdon circuit, to ride crits which were huge fun. I was always trying to create breaks and get clear of the sprinters – like Jan Birkmyre! My first National 10 mile Time Trial was also in 2005, it was up North and the friend I was travelling with was so horrified that I was planning to ride it on a road bike, that he lent me his Zipp 404s. I think he was afraid to be seen with someone who didn’t look like they knew what they were doing! I was lent a TT bike for my first 25mile TT and again it was the National Champs. I rode the loan bike around the block once, reckoned it fitted (although I’m not sure I would have noticed if it hadn’t) and the following day I threw myself into the race having never ridden in a TT position before. It was truly a baptism of fire, but I was pleased to place 13th. The first track race I remember was the National Masters in 2006 at Welwyn. As a few of my friends were going, I thought it would be a good laugh, so I pitched up with a borrowed bike (again), some wheels and a good friend (who was the only one out of us who knew what was going on)! The friend put me on the bike, on the track and told me to cycle as fast as possible for the required amount of laps. I did exactly as instructed and was very surprised to win the title … I’m still not really sure of how that happened! TORQ: What is the one thing you know now about training or racing that you wish you had known 10 years ago? Mel: I wish I had known more about nutrition and the need for recovery. I used to do far too many unstructured hours on the bike, after far too many hours in the office and almost no food. I would be seen training in Richmond Park at 10pm – having not eaten properly throughout the day. Needless to say, my seasons were very short, as I would very quickly exhaust myself and then I would go off the boil both mentally and physically. As for nutrition, this year, my team mates coined the term “Mel-nourished,” when they heard about my fuelling, so it is fair to say that I’m still learning about that side of things. Happily the guys at TORQ know a thing or two about that and have been very helpful and incredibly patient with me! TORQ: What is your greatest cycling achievement? What made it special? Mel: Winning the bronze medal in the Elite National Time Trial Championships really stands out for me, but the gold medal in the Team Pursuit at the World Masters Track Championships last year is special too. This was special as I had done the impossible and got back on my bike after six years away from training and racing completely. I had just nine months to prepare before the World Masters and it was really hard getting back into the sport at such a high level after so much time off, not to mention juggling family life with training commitments. TORQ: What is the most adventurous/unusual or fun thing you have done on a bike? Mel: I rode from Lhasa to Kathmandu, before the roads were paved – they were just corrugated dirt tracks and the average altitude was 4,500m all the way up to Everest Base Camp, on the Tibetan side. It was an amazing trip lasting just over a month. Imagine being on a dirt track climb for five hours or more with 50% less oxygen than you are used to – having not had a shower for three weeks. We rode through sandstorms day after day, hour after hour. It wasn’t pretty, but it was pretty epic and an amazing way to see the country and culture. Thankfully I didn’t suffer with altitude sickness, but I was battered and exhausted from the corrugated roads, wind, sand and from not really ever getting a good night’s sleep – it all took its toll. The saddle sores were awful and very painful for the first hour each day, then I think my body just grew numb to it, or perhaps it was that other parts of me hurt more, I’m not sure which? I loved it. afterwards! The scenery was truly spectacular and the people were fantastic, surviving in a very difficult environment and a totally barren landscape. The food was interesting as well, there was a lot of dal and rice, curried vegetables and the occasional chicken, which we’d buy going through a village. It would run around our camp for a few days and we’d make friends with it, only to find it served up for supper a few days later. Strangely, I crave Carrs Water Biscuits and unsalted butter. I know that’s a bit odd, but I could eat this every day. TORQ: How many bikes do you own? And what about non-cycling acquisitions? I only own four bikes now, but that is soon to be five with the arrival of the custom carbon track frame from Wilier. For now I have a track pursuit bike, a road time trial bike, a road bike for training and racing and also a cyclo-cross bike, which doubles as my Winter training bike. My non-cycling obsession are my garden plants. I have grown and collected plants from various gardens and friends – we all do plant swaps in October/November. I am a total beginner at this gardening malarkey, but I have had some success with roses, which are fairly sturdy and seem to respond to my novice green fingers. I am a full time mother to two year old Toby and four year old Arabella and wife to my husband Edward – need I say more?! They have masses of energy and keep me on my toes. On any given day, I am a personal assistant, taxi, doctor, chef, peace-keeper, negotiator, engineer, toy mender, artist, musician and countless other roles that I need to morph into. I love it and wouldn’t change it for anything. Thankfully, my husband is hugely supportive of my racing and so time to train at weekends is easily negotiated. Ed leaves at 5.30am and returns at about 8pm, so generally training gets done in the evening after I have put the children to bed and before he comes home, or sometimes I will try and negotiate ‘down time’ during the day, whereby Toby has a sleep and Arabella does some painting or drawing for an hour. This usually works well, except that I often have to draw something in between intervals! What I manage to draw, paint, stick or cut out depends on the length of the recovery. TORQ: What is your favourite (or perhaps your most dreaded) session? We wish Mel every success juggling family life with her cycling this season and will be reporting her results here. 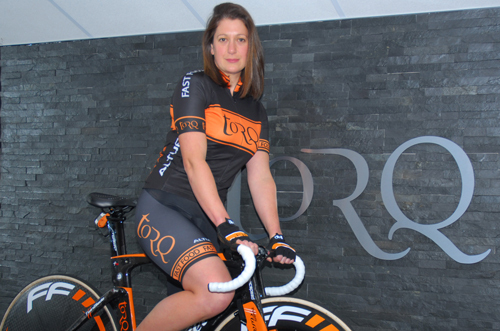 As part of the TORQ Performance Track Team.